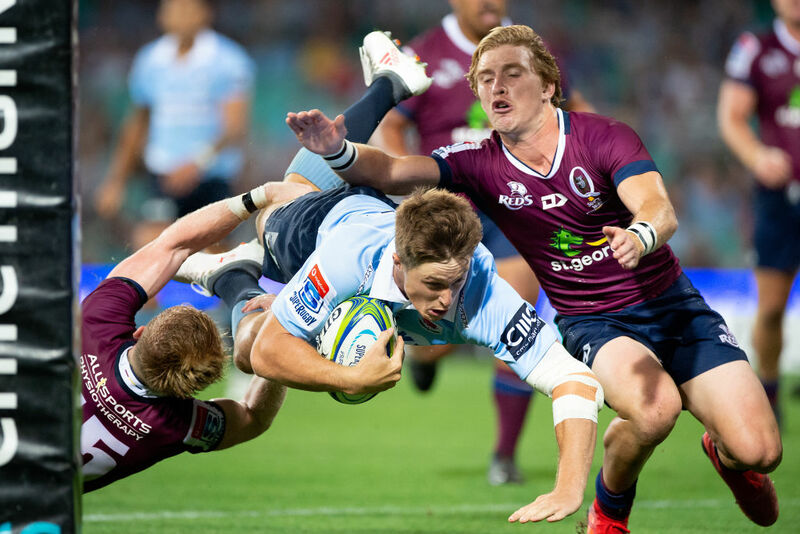 The NSW Waratahs have retained interstate bragging rights with a 10th-straight Super Rugby triumph over the Queensland Reds. It wasn't pretty, but the Waratahs ground out a 28-17 victory over their arch rivals on Saturday night, the two sides destroying the famous SCG turf in the process. Curators were almost as busy as the players. At one point late on, four groundsmen were required to repair a series of gaping holes that would likely leave the Sydney Swans seething ahead of their looming start to the 2019 AFL season. "It's professional sport ... so that was disappointing," he said. "Rugby grounds, obviously there's a lot of running around and tackling but there's some things - the mauling and the scrummaging - so the ground's pretty important." NSW coach Daryl Gibson agreed the surface was an issue. Officials and the SCG Trust have just a fortnight to try to resolve the problem before the Waratahs host the defending champion Crusaders. "It's certainly something the powers that be will look at and (consider) how it's rectified for the next game," Gibson said. Despite conceding two soft first-half tries to Samu Kerevi and Chris Feauai-Sautia, who waltzed through non-existent Waratahs defence, Gibson was thrilled with his side's steel. "We had 32 percent of the ball, (made) 170-odd tackles, so we showed some real character there and withstood a lot of pressure," he said. With both sides scoring three tries apiece, it was 13 points from the boot of five-eighth Bernard Foley that proved the difference in front of a disappointing crowd of 15,681 for the conference derby. Waratahs captain Michael Hooper was happy to escape with the four competition points. "We haven't really hit our straps yet in attack but we ran some really nice plays there tonight out of our own end," Hooper said. "I was pleased how we played to the end. That try at the end was a testament to our work rate - really pleased with that win." The Waratahs' victory was their second from three outings this campaign and consigned the Reds to a worrying none-from-three start. The Waratahs head to Canberra next week to play the Brumbies, with the Reds off to Tokyo for a must-win clash with the Sunwolves.